WHEN: Today, September 14 (Monday), 11:00 a.m. 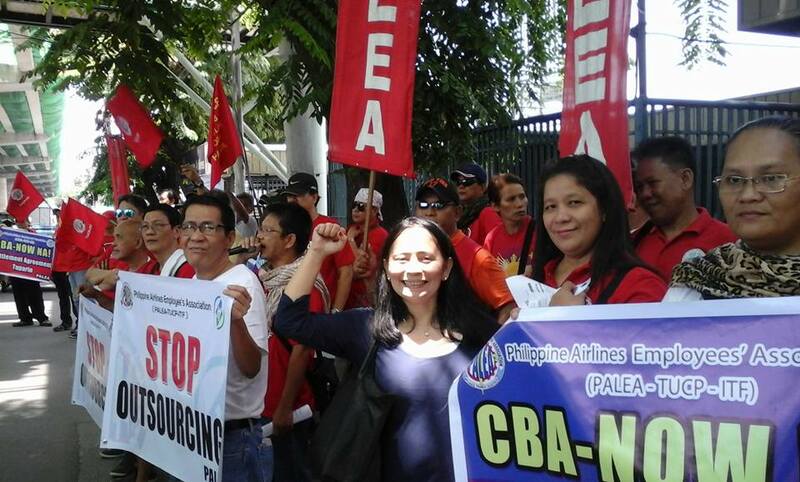 DETAILS: The Philippine Airlines Employees’ Association (PALEA) will hold another protest today against the latest round of mass layoffs at Philippine Airlines (PAL). More than a week ago PAL announced the retrenchment in November of 117 employees all working at domestic airports all around the country. The picket today follows on the heels of similar protests last week. Aside from opposing the latest retrenchment, PALEA is also calling for the opening of collective bargaining negotiation and the full implementation of a settlement agreement that ended the dispute over the last mass retrenchment in 2011. The mass actions are the start of a renewed campaign to oppose contractualization and outsourcing. It will continue on to PALEA’s 69th year anniversary on September 21 and then escalate in November in time for the APEC summit.